An antibacterial soap is a cleansing product designed to kill germs on the hands or body. These soaps are made in either liquid or bar form by blending detergent additives with ingredients, which have antimicrobial properties. Antibacterial soaps were originally marketed as deodorant soaps to control body odor caused by the action of bacteria on perspiration. These products, sold in bar form, gained popularity in the 1950s under such well-recognized brand names as Dial and Lifebouy. While many of these bar soaps are still available today, liquid antibacterial soaps used for disinfecting hands are becoming increasingly more popular. Major brands include Lever's Caress, Dove's Liquid and Proctor and Gamble's Oil of Olay liquid. In addition to these products intended for consumer use, other antibacterial cleansers are available for use by health care professionals. Such specialty products include surgical scrubs, wound disinfectants, and wound cleansers. In the United States, all soaps that make antibacterial claims are classified as over-the-counter (OTC) drugs because they are sold to kill germs. This designation means they can be purchased without a prescription as long as they adhere to guidelines set forth by the Food and Drug Administration (FDA). These guidelines are established in a document known as a monograph which specifies which active ingredients can be used, the claims that can be made, and so forth. As of 1998, the FDA has not issued a final monograph on antibacterial soaps, but over the last 25 years they have published a series of Tentative Final Monographs (TFMs). 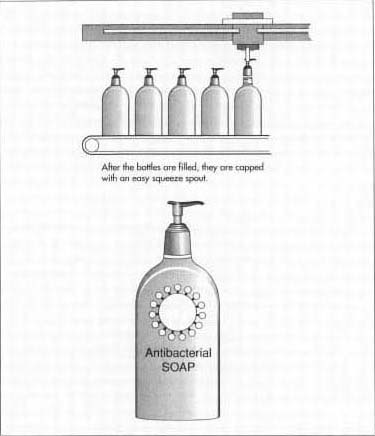 The first proposed monograph, published in 1974, officially defined an antibacterial cleanser as a soap containing an active ingredient with invivo and invitro activity against skin organisms. It also suggested that antibacterial cleansers be grouped into the following seven categories: antimicrobial soaps, health-care personal hand washes, patient preoperative skin preparations, skin antiseptics, skin wound cleansers, skin wound protectants, and surgical scrub hand soaps. In 1978 the agency issued a TFM which began formal adoption of the definition and of the categories proposed in 1974. This tentative monograph allowed products to use terms like deodorancy and reduction of body odor. However, this version of the monograph was never finalized, and in 1991 the FDA issued another TFM with different rules. The 1991 TFM separated first aid antiseptics into a different category, which included skin antiseptics, wound cleansers, and wound protectants. Later monographs placed consumer and professional products into separate categories. Then, in a surprising move in 1994, the agency reversed the earlier tentative monographs that had recognized antibacterial cleansers specifically for consumers. The 1994 TFM does not directly allow antimicrobial soaps for home use. While it does not disallow these products, it does not set up separate rules for them. Therefore, consumer products must use the same active ingredients as professional health care products. More importantly, they are limited to the same types of claims that professional products can make. This is problematic because consumer products have different requirements than medical products. For example, deodorant soaps are intended to control body odor while professional surgical scrub products are not. On the other hand, professional products must be safe enough to use up to 50 times per day, whereas consumer products are typically not used more than two or three times per day. For these reasons and others, many soap manufacturers believe that consumer and professional products should be regulated separately. The FDA, however, tends to disagree. The regulatory status of antibacterial soaps is still tentative; the monograph has not been finalized and industry experts do not expect it to be ready until after the year 2000. Today, annual sales of antimicrobial products in the United States have reached $600 million. However, the many antibacterial deodorant bar soaps for controlling body odor have largely been replaced by antiperspirants/deodorants. The growth in the antibacterial soap market has come primarily from the increased sales of liquid hand cleansers. Water is the most abundant ingredient in antibacterial soaps because it is used as a carrier and a diluent for the other ingredients. Deionized or distilled water is used in cleansing products because the ions found in hard water can interfere with certain detergents. Formulas may contain 40-80% water. Although the FDA has not yet officially ruled which active ingredients will be allowed by law, there are two ingredients commonly used in the industry at this time as antibacterial agents. One is 3,4,4'-trichlorocarbanilide (commonly called trichlocarban), which is used in bar soaps. The other, more common ingredient, is 2-hydroxy-2',4,4'-trichlorodiphenyl ether (commercially known as triclosan), which is used in liquids. These ingredients work by denaturing cell contents or otherwise interfering with metabolism of microbes. They are functional at levels as low as 0.5%. Both are effective against a broad range of microorganisms. The same types of detergent ingredients used in common household and personal care cleansing products are used to make antibacterial soaps. Detergents and soaps are technically known as surfactants, which are materials that have the ability to solubilize dirt and oil. Surfactants are responsible for a product's ability to generate foam. The chemist must blend surfactants together to optimize foam and cleansing properties while minimizing negative effects like stripping skin of natural oils. Surfactants are loosely grouped into two categories: primary surfactants, which are responsible for foam and cleansing; and secondary surfactants, which work with the primaries to give the foam more creaminess, improve skin feel, and so on. Common primary surfactants include alkyl sulfates, alkyl ether sulfates, olefin sulfonates, and amphoterics. Blends of these materials can typically comprise 20-40% of the formula. Secondary surfactants may be materials such as amides, betaines, sultaines, and alkyl polyglucosides. These are typically blended to optimize foam and cleansing characteristics while maintaining cost guidelines. They are typically used in the range of 1-10%, depending on the requirements of the formula. A variety of other ingredients are added to modify different aspects of the formula. These include thickeners, fragrances, colorants, pearlizing agents, preservatives, and featured ingredients. The first ingredient added to the tank is typically water because it is usually the most plentiful ingredient. The other ingredients are added to the tank as specified by the manufacturing procedure. Ingredients that are heat sensitive are added as the batch is cooled to room temperature. how the product flows. Gums, starches, and polymeric materials are used for this purpose at 0.1-1 %. Fragrances are aroma chemicals, which are added to mask the odor of the base and increase consumer appeal. These may be a variety of natural and synthetic materials blended together. In fact, a fragrance may consist of dozens of individual components. The compounded fragrance must be checked to make sure it is compatible with the detergent base. Fragrance is commonly used at levels ranging from 0.1-1%. Pearlizing agents are included to opacify the formula and give it a more pleasing appearance. These are typically fatty alcohol type materials such as glycol stearate, although titanium coated mica can also be used to give the product an attractive pearled appearance. These materials are used at 1% or less. Preservatives are added to liquid soaps to prevent microbial growth. While the product contains other antibacterial agents, these are designed to kill skin organisms and may not be adequate to protect the product from other microbes such as molds and fungus. Therefore, additional preservatives may be added to the formula to provide broad spectrum protection. Preservatives are effective at 1% or less. Various botanical extracts, proteins, natural oils, and other exotic materials may be added by the formulator to increase the product's appeal to the consumer. 1 Before manufacturing begins, the ingredients may be analyzed to ensure they meet quality standards. After approval, the ingredients may be pre-weighed and stored near the batching area to facilitate handling during manufacture. The equipment must also be properly prepared before batching can begin. The tanks, plumbing lines, pumps, and transfer vessels must be cleaned and sanitized before manufacturing begins. This procedure helps to prevent microbial contamination of the batch and to make sure any traces of chemicals used in the previous batch are removed. Chemical contamination can ruin a batch because some ingredients (such as certain cationic and anionic surfactants) are incompatible and may react to form an insoluble precipitate which can clog filters, pumps, and transfer lines. 2 Liquid antibacterial soaps are typically manufactured in large stainless steel tanks. These vessels are available in a variety of sizes, but a typical batch could be as large as 3,000 gal (24,000 lb). Mixing and heating in these tanks must be carefully controlled during the batching process. Mixing is accomplished with a propeller or a sweep-style mixer, which provides good agitation without whipping an excessive amount of air into the product. Heating (or cooling) may be accomplished if the tank is equipped with a hollow jacket that can be filled with steam or chilled water. Sophisticated manufacturers employ automated computer systems to control mixing speed and temperature to ensure batch quality will be consistent. The first ingredient to be added to the tank is typically water because it is usually the most plentiful ingredient. The other ingredients are added to the tank as specified by the manufacturing procedure; ingredients that are heat sensitive are added as the batch is cooled to room temperature. The batch is allowed to mix for a specified time at a controlled temperature to obtain an homogenous product. After batching has been completed, a sample is analyzed to ensure it meets specifications before the product is released for filling. 3 Onc e the product has been completed O and is approved, it is ready to be filled into the appropriate packages. 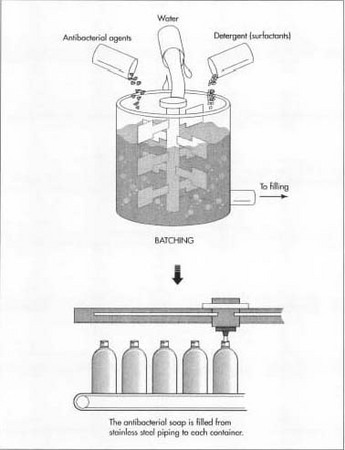 Filling can be initiated immediately after batching by pumping the product directly to a conveyor line outfitted with filling equipment. Alternately, the product may be transferred to a temporary storage tank and filled later. The filling apparatus consists of a series of nozzles, which are metered to deliver a specific amount of product. Plastic bottles are fed into a hopper and directed under the filling nozzles via a conveyor system. The nozzles fill the appropriate amount of product into each bottle. After filling the bottles are sealed with screw-on caps or dispensing pumps. The bottles then move down the conveyor line where the lot number and an ink-jet printer codes expiration date on the side. The bottles are then packed into card-board cartons for shipping. Several steps are built into the manufacturing procedure of antibacterial soaps to guarantee high quality. Prior to commercialization the formula is stability tested to ensure the product's functional and aesthetic properties remain unchanged over time. OTC products are required to have a three-year shelf life. During the manufacturing process, the quality of the ingredients is chemically tested before batching begins. After batching is complete, the product is tested to make sure ingredients were added in the correct proportions. Some of these tests evaluate the product's physical properties such as viscosity and pH. Other tests are conducted to evaluate the product's antibacterial properties. Once such test, known as the glove juice test, is done by sampling the perspiration which collects inside a rubber glove worn by a volunteer who has used the test soap on one hand. This glove juice is then tested for microbial growth by applying it to a plastic plate that is specially coated to promote growth of skin organisms. If little or no growth is seen on the test glove, it can be assumed that the product is performing as it was intended. A significant amount of waste can be generated if batches of antibacterial soaps are made incorrectly. Fortunately, many of these batches can be salvaged if they are within certain limits. For example, adjustments can be made to batches deficient in certain ingredients. Similarly, batches that are high in actives can be diluted to be within specifications. However, if batches are contaminated with extraneous materials they must be disposed of because the law does not allow the sale of adulterated products. Disposal must be done in accordance with appropriate local, state, and federal regulations because of the drug status of the product. The future of antibacterial soaps depends on both chemical and regulatory factors. New chemicals for cleansing products are continually being developed. These new materials may offer improved foaming or cleansing properties, enhanced biodegradability, increased mildness, reduced cost, or other benefits. It is almost certain that such new ingredients will find use in future antibacterial soap formulations. Factors related to the regulatory status of antibacterial soaps are less certain. These factors will not be decided until the FDA finalizes the monograph, which is not expected to occur for the next few years. Once this happens, the products may have to be changed significantly to comply with the regulations. "The Antimicrobial Debate." Soap/Cosmetics/Chemical Specialties (November 1995). Jungerman, Eric. "Antimicrobial and Deodorant Soaps: Impact of Regulatory Developments." Cosmetics & Toiletries. Allured Publishing Corporation, May 1996. Paulson, Daryl. "Developing Effective Topical Antimicrobials." Soap/Cosmetics/Chemical Specialties (December 1997). Znaiden, Alex. "The War Against Germs." Drug and Cosmetic Industry 162. Advanstar Communications, January 1998. I am interested to make a botanical pesticide insecticide for poor farmers in remote desa2, of neem seed material, soap, and can withstand the sun (the object of planthopper pests - all caterpillars including scirpophaga innotata (walker), winches rice stalks, can guide me to be a formula shares of the following ways / methods / dose ingredients, fermentation / methanol extracts, thanks to its previous guidance.